It’s the last Saturday of the month, which means it’s Give a Sh*t Book Club time! 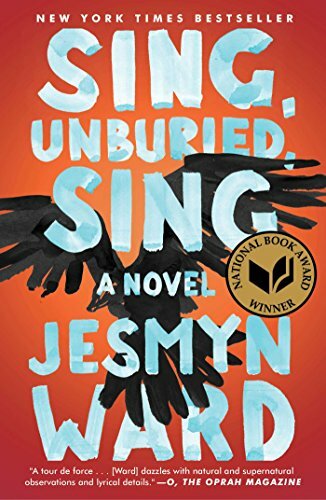 This month our pick is Sing, Unburied, Sing by two-time National Book Award winner Jesmyn Ward. It’s a road trip novel sprinkled with magical realism set in rural Mississippi. Now that I read back over it, that description makes it sound slapstick and whimsical, but I can assure you it’s much, much darker than that. February is a short month, and even though I started the book with what I thought was plenty of time, it’s so heavy it took me quite a while to read and even longer to process all my thoughts and feelings afterwards. Leonie will certainly be a polarizing figure. I’m sure a lot of readers will hate her for the way she continually fails her children, and wow does she fail them awfully, but I thought Ward did an amazing job of illustrating her inner turmoil. After all, addicts are narcissists. Not only was she always selfishly pursuing her next high, but every time she even thought about breaking her pattern and doing the right thing for her children, she would look at Jojo’s face and see his disappointment and anger and melt back into herself. It was easier to numb herself from the pain of knowing that her thirteen-year-old son was a more stable adult than she was than to try to swim against the tide and be someone better. Jojo broke my heart, of course. I’m not sure what else to say about him. I thought the magical realism elements were very well done, especially the ghost of Richie. When we finally find out the ending to his story, it adds such weight to the family’s history. I also loved how this was a book that was about Parchman prison without ever really looking at it head-on. The present-day characters are there for only the briefest of scenes, and then it’s back on the road. What did you think of Sing, Unburied, Sing? Comments are open below. Can’t wait to hear your thoughts!